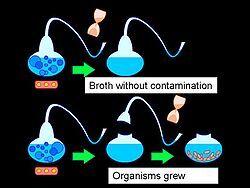 Illustration of swan-necked flask experiment used by Louis Pasteur to test the hypothesis of spontaneous generation. A hypothesis (from Greek ὑπόθεσις, hupothesis) consists either of a suggested explanation for a phenomenon or of a reasoned proposal suggesting a possible correlation between multiple phenomena. The term derives from the ancient Greek, ὑποτιθέναι, hypotithenai meaning "to put under" or "to suppose." The scientific method requires that one can test a scientific hypothesis. Scientists generally base such hypotheses on previous observations or on extensions of scientific theories. In common usage in the 21st century, a hypothesis refers to a provisional idea whose merit needs evaluation. For proper evaluation, the framer of a hypothesis needs to define specifics in operational terms. A hypothesis requires more work by the researcher in order to either confirm or disprove it. In due course, a confirmed hypothesis may become part of a theory or occasionally may grow to become a theory itself. This page was last modified on 29 March 2013, at 22:23.